I came across Jessica Park's Flat-Out Love purely by accident. Over the summer I try to read as many books as possible before I have to head back to work. While downloading a slew of books from Amazon, Flat-Out Love popped up after I paid under the section that said, "Other customers who purchased Blah, Blah, Blah also bought..." You get my point. I downloaded Flat-Out Love, plus a few more books, because in all honesty, they were cheap. I LOVE cheap (so does my husband, even more than me). Unfortunately, summer ended too quickly and my reading halted until Thanksgiving break. This is when I finally sat down and read Flat-Out Love. I normally don't enjoy the young adult genre as much as I do other genres, but this book was definitely the exception. Flat-Out Love begins with a young girl named Julie Steagle standing on a Boston street where her newly rented apartment should be. But instead of a three bedroom apartment with roommates, she finds a burrito joint in a single story building. Set to start at Whitney College in the fall, being homeless couldn't come at a worse time. Feeling slightly defeated and a little snarky, she calls her mom. Luckily, her mother's old college roommate lives in the area and agrees to take Julie in until she can secure a more permanent living arrangement. Moving into the Watkinses' home changes Julie's life. As she navigates through her first year of college, she finds herself trying to help this dysfunctional, failing family. Matt, an MIT geek with an obsessive nature and an overwhelming school schedule, slowly opens up and allows Julie a glimpse into his family. His absentee, workaholic parents, his brother Finn who is lost somewhere in the world and Celeste, the youngest of the three Watkins children, who seems to be suffering from some type of separation anxiety and proceeds to carry around a life-sized cardboard cut-out of her non-existent brother, Finn. Julie slowly forms a bond with everyone in the family, including the elusive, Finn via Facebook. But the more she gets to know the family, she realizes they are far more broken than she thought. 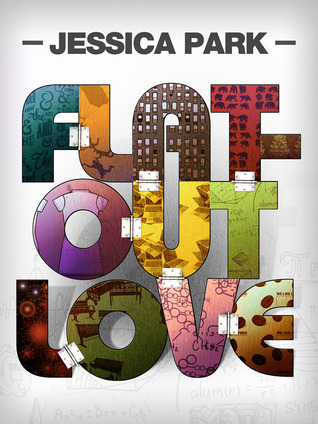 Flat-Out Love is a great story of love, loss and families. I am one of those people who enjoys a good love story and this book did not disappoint. It made me laugh. It made me cry. It made me believe in true love. Jessica's writing is superb and so is her quick wit and her spot on sense of humor. This is a fine example of a self published book done right. 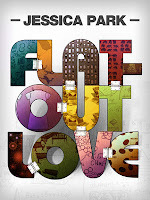 If you get a chance check out Jessica Park's, Flat-Out Love. It's a sweet, quick read and it will make you smile.